I've noticed a new trend in my family's schedule that I am loving, Sunday is for FOOD! The kitchen is always busy on Sunday, with treats in the oven, soups on the stove , and snacks for the week being created, it's a yummy day! I am going to start sharing more of my weekend cooking with you, sound fun? Today my girl and I had a "double" playdate day, we both had friends over... Connie stopped by with her hubby, Maurizio. She used to live in Ithaca and luckily she still comes back often so we get to visit multiple times a year! Connie shared with me earlier this fall that she loves everything pumpkin, so I decided to make her my version of pumpkin bread. I've found that it takes an hour for the bread to cook, so I always save some batter and make a batch of mini-muffins that cook quickly. That way we have something to snack on while we wait for the bread. Besides the ginger pumpkin bread we had cashew chili (vegetarian) going in the crockpot for a chili cook off we went to later in the day... my secret?... a bottle o' beer! 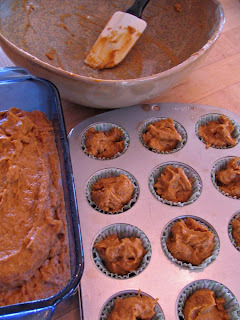 Preheat oven to 350 degrees, grease a 9 x 5 inch loaf pan, and a 12 count mini-muffin tin (I used papers in the muffin tin). In a large bowl melt butter in your microwave. While the butter is cooling, in a medium bowl, mix together the flour, spices, baking soda and salt. Bake Muffins for 15 mins and Bread for 55 minutes. You may want to make a tent of aluminum foil for over the bread after the first half hour if the top starts to brown too much. Take out and cool 10 minutes before slicing and eating! Yummm! 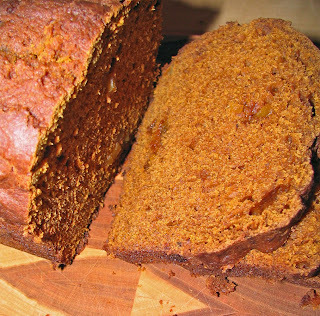 Thanks for the pumpkin bread recipe! We all love ginger so I'm sure it will be a hit in my house. Thanks for the recipe! I actually made banana bread yesterday - but this recipe sounds divine! I was going to call you for your recipe. Mine has been hiding so this is perfect! Let me tell you (dear readers), from personal experience, this woman can COOK/BAKE like no one else! I gave the recipe a try this weekend and loved it! Thanks for sharing. The mini muffins are a brilliant idea. Would you share your chili recipe--the thought is delicious! Yum! 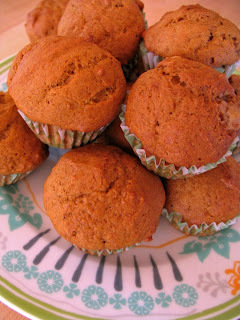 Thanks for the recipe; I love anything pumpkin! Cool blog you got here. It would be great to read more concerning that theme. Thanx for posting that data. Discovered your blog through this pumpkin post and couldn't wait to make it. Many thanks for sharing so many beautiful (and tasty) things. A little bit o' everything!